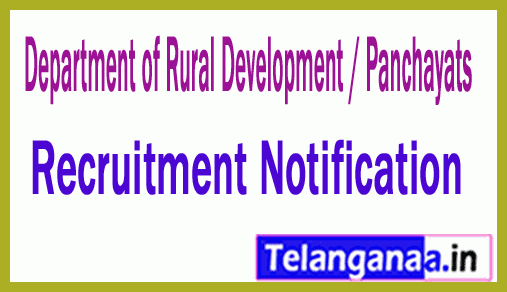 With the name of recruitment of rural development and Panchayats, a newest career advertisement has been released by the Department of Rural Development and Panchayats, which will inform the most qualified and effective Indian citizens for the 19 vacancies of Cluster Manager, Program Manager, Functional Manager . Eligible candidates can apply for vacancies in rural development departments and panchayats by submitting applications through offline mode before the last date of 28th January, 2019. Candidates who are willing to apply for their upper age limit are 55 years of age. Amendments: The applicants who will be appointed against this recruitment, they will get Rs. Will get consolidated salary of 45,000 / - (post 1), Rs. 30,000 / - (post 2), Rs. 25,000 / - (post 3), Rs. 18,000 / - (post 4). Rupees. 20,000 / - (post 5.6) from recruitment organization. Candidates' engagement presentation, written examination and typing test will be based on their performance in the interview, which will be run by the recruitment committee of Rural Development Department / Panchayats. The job seekers are interested in applying for the above positions. First of all, they will have to go through the official website http://moga.nic.in. Once the successful application form, Indian citizens should send the complete application form to the mailing address given below.